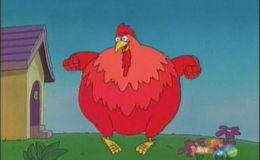 Is the Big Red Chicken from Dora the Explorer guest writing today? That sounds represent me at my first ever writing critique group. I was a big chicken. Uma galinha grande, my mom would say. Un pollo grande, my dad would say. Yes, I can be called a coward in three languages. Impressive, I know. I decided to join the Society for Children’s Book Writers and Illustrators because I had heard great things about the organization, which has events during the year and offers local writing groups. I wanted to join a critique group for a couple of reasons. My primary reason was to meet and work with other writers. Writing is a solitary act. It’s just me and the laptop. 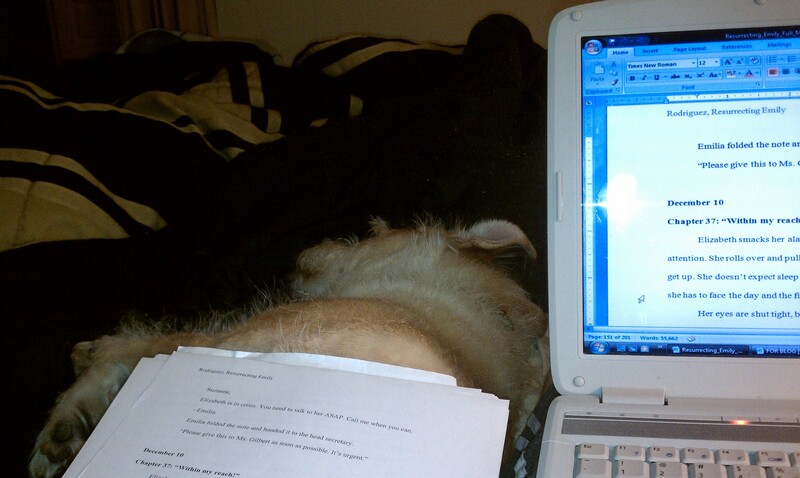 My faithful dog might be snuggled by my side, which is nice, but he’s not great at giving feedback. My friends who read for me, on the other hand, are great at giving feedback, but they have busy lives. I sometimes feel guilty adding my writing to their lists of things to do. For example, my longtime friend Matt Eagan and his wife Sarah just had a baby girl yesterday. Welcome Grace Mary Eagan!! I’m not about to ask Matt to read for me at such an important time for his family. With a critique group, I could attend and know that for a couple of hours once a month, a group of people are ready and willing to read and offer suggestions. That they are strangers is a plus since my parents will praise anything I produce. That’s nice for the ego, but I do need real constructive criticism as I write. So, I attended my first group on Tuesday, July 19 in Hamden, CT. The second to arrive, I signed in and waited. A dozen people came. After introductions, the coordinator said we would share in the order in which we arrived. He was first to arrive and didn’t have anything to read. So, I was up. As much as I wanted to join a group, I wasn’t sure how this would go. I had heard stories, good and bad, about critique sessions. One person I know said he was kicked out of his group. Then, he said he kicked himself out. Either way, that didn’t sound good. I know that when I get published (positive thinking in effect here) I will likely get some rake-me-over-the-coals reviews. Even international best sellers and award winners get those nasty one-star critiques on Amazon and Goodreads. I get that. I would have to deal with that. But in the moment, there in the Hamden senior center, I chickened out. It’s not that I’m not able to handle criticism. As a former journalist, I was edited daily and often had to rewrite articles multiple times. I have pretty tough skin. I think being the new girl had more to do with it. It’s like going to a party where you don’t know anyone. As soon as you walk in the door, they throw a spotlight on you and ask you to show off your best dance move. The music is blaring and everyone has stopped to watch. I’ve got some moves–at least I did back in the day–and still, I would definitely stand frozen like a deer caught in headlights. So, I decided to pass. I wanted to observe the group dynamics first and see if I would be comfortable sharing in the future. Turns out, I had nothing to worry about. The group was positive and supportive. Those who read received helpful advice and I felt comfortable jumping in and offering some suggestions, too. My plan now is to visit some other local groups to see which one is the best fit for me. Then I plan to attend meetings on a regular basis to build connections with some fellow writers and get the feedback I need. Next time, I won’t be such a big chicken. Thanks, Tom. That’s a good suggestion :.) What’s funny is that I’m usually running a little late, but I happened to be first that night. I’ll be fashionably late next time! Chicken? No way! You went and walked through the door! That in itself is a big step.